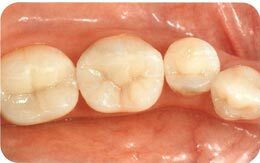 Dental inlays are used to treat teeth that have decay or damage lying within their indented top surfaces. 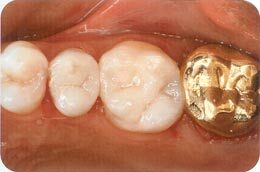 They can also be used to replace old or damaged metal fillings. Inlay placement is usually carried out over two appointments. During your first visit to the dentist, an impression of your tooth will be taken, and a temporary inlay will be placed over the tooth. The dentist will send the impression off to a dental lab, which will create the inlay to match your tooth’s specifications. When you return to the dentist’s office, the temporary inlay will be removed and the permanent one will be placed carefully over your tooth. There is no downtime after receiving a dental inlay, only a mild level of tenderness in the treated area, so you can return to work or other activities as soon as you leave the office. Whereas dental inlays are designed to treat decay within the cusps, or top projections, of a tooth, onlays are used to treat decay that extends to one or more of the cusps. Onlays are placed in much the same way as inlays. First, an impression of the decayed tooth is taken, and a temporary onlay is placed over the tooth. The impression is then sent to a lab, where a dental technician creates the onlay according to the tooth’s dimensions. When the patient returns to the dentist’s office, the temporary onlay is removed, and the permanent restoration is placed on the tooth and securely bonded using high-strength dental resins. Like dental inlays, onlays can be created from tooth-colored material, which makes them virtually undetectable to the naked eye. Onlays also help to conserve more tooth structure because their use requires minimal removal a tooth’s surface. Perhaps their most important benefit, however, is that, in saving damaged teeth, onlays help patients avoid the eventual need for more extensive treatment with dental crowns & bridges, or dental implants.